Special Exhibition at at TOKYO DESIGNERS WEEK 2011 "Food Container Competition"
This installation projects dining scenes and various images onto a table made from countless interconnected plates. 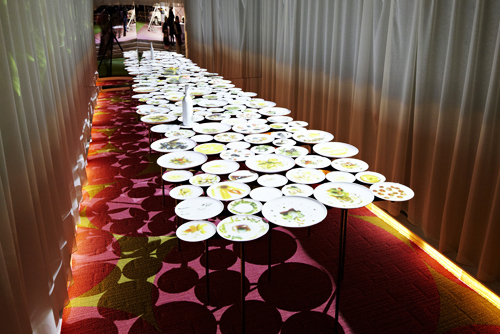 The installation proposes a new vision of "food" through the plates. In China, there is a tradition of laying out many plates on a table when welcoming guests. As a number of plates signify a class of meal served in a European full-course dinner, a significant number of plates are indicative of dietary affluence. The table is made only from countless plates and shaped like a European-style long table, sized so that it matches the form of the container. The plates are placed with minimum space in between, and by setting steel frames only in places where the plates are connected, only the plates are visible from the above. No food is actually put on the plates; the plates are used as screens. By projecting the dining images on the plates from the above, we try to recreate the dining experience. From the above, we filmed an entire dinner, which has actually taken place elsewhere, beginning from its preparation to toast to finishing the meal. We precisely replicated the placement of the plates and projected the filmed images exactly on the same plates. Through this method, the installation gives the feel of a banquet of ghosts. Copyright © id+fr All rights Reserved.